Congress: On April 13, the state legislature produced a congressional map signed by the Governor. State leg. : On July 29, the politician commission responsible for state legislative lines approved final state legislative maps. Court challenges to the state Senate map were rejected. Arkansas' congressional lines are drawn by the state legislature, as a regular statute, subject to gubernatorial veto. Census data were delivered to Arkansas on February 10, 2011. Arkansas state law does not impose a particular deadline for drawing congressional lines, though candidates must file for congressional primary elections by March 8, 2012. [Ark. Code § 7-7-203(c)(2)]. The regular legislative session began on January 10, 2011, and ended April 27, 2011. At least for the state legislative redistricting, the commission has posted meeting archives here and here; there is also a calendar for scheduled hearings. Beyond these hearings, the commission has invited public comment here. Arkansas must also, like all states, abide by section 2 of the Voting Rights Act. 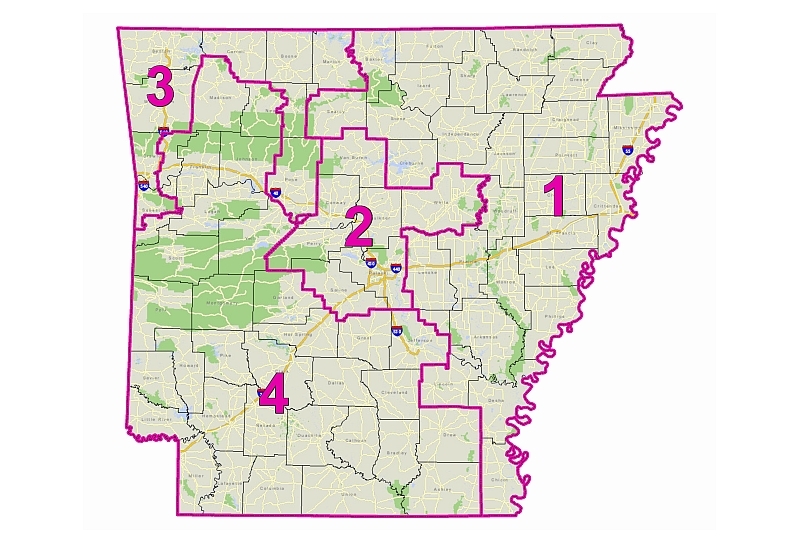 For its congressional lines, Arkansas adopted guidelines in 1991 expressing a desire to maintain county lines, cities, established geographical boundaries, and connections to previous districts, where possible. Similar guidelines were rejected in the 2000 cycle. In the 2000 redistricting cycle, Arkansas' commission drew state legislative lines; the legislature passed congressional lines, which became law on April 20, 2001, without the governor's signature. It appears that neither plan was challenged in court.